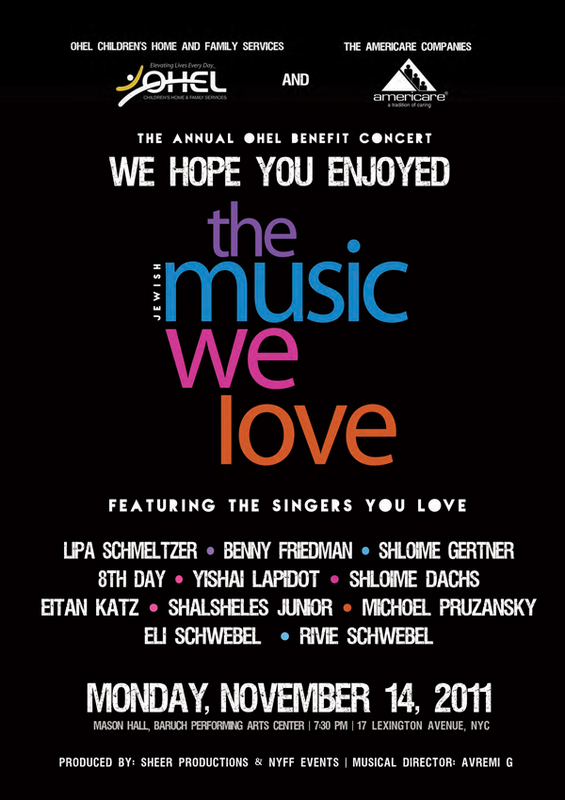 One of the best kept secrets in the Jewish music business was the lineup for tonight’s Ohel concert, titled The Music We Love. For those of you who weren’t there tonight, you missed an awesome show as the performers came fast and furious, hotter and hotter. Without MBD and Avremel??? the rest are good on cd but not in live performance. Well, apparently the approximately 1000 people last night at the concert disagreed with you because the place was on fire. Aside from a little tweaking, this was probably the best Ohel Concert of all time. I was there in 5758 the ohel concert which to date has probably received the most attention and sold the most videos. However, I would say there were aspects of last nights concert that outdid that historic show. An interesting thought perhaps and apropos in light of the ‘Arab Spring’ last nights Ohel concert showcased for the most part the youth of today’s Jewish Music Industry. Aside from Rivi Schwebel who performed with his children the majority of the lineup was up and coming stars such as Eitan Katz, Shloime Gertner, 8th Day, Benny Friedman and so on…. I agree with number 2, the auditorium was on fire. The reception of the audience definitely added to the electricity of the evening and all in all it was a spectacular event. Thanks to the sponsors and all those who were involved in planning it. i noticed shloime dachs was advertised to sing but didnt (im not complaining). any reason why? Where was he advertised to sing? Remember, top secret lineup? He actually came on stage to sing with his son for a few minutes. yishai without oif simchas?? they should have all come. WILL IT BE RELEASED ON DVD OR CD??? your list doesnt say his name but the poster does.thats why i was unsure. Shloime Dachs did sing on stage. The question I have is that the hints they had on a their final ad were not all fulfilled. “This singer has his heart in teh right place”. I assume that was gonna be “Shwekey – Libi Bamizrach”, but he wasnt there. Does that hint apply to anyone else? There was another hint about this group having become a major youtube sensation. I assumed that was gonna be the Macabeats, bu tthey werent there either, so who was that? The way I see it some of the performers were cancelled either on their part or Ohel’s. Someone enlighten me. Shlomo: Heart in the right place was Eli Schwebel. Group with major YouTube sensation…hello? Ever hear of 8th Day and Yalili? And Paul, which poster listed Shloime Dachs? He was on stage for a few minutes singing with his son and is featured on the souvenir CD that Ohel gave out. Shloime Dachs must be the answer to the hint of the singer that has released best selling albums for over two decades. Paul: Oh sorry, didn’t see that poster but I see it now. You are correct, Dachs is on there.